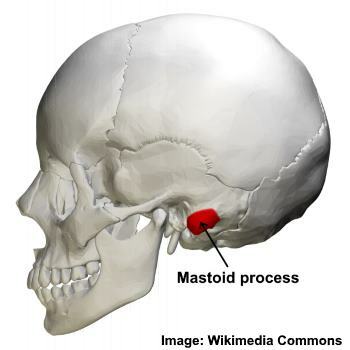 Your mastoid process is a part of your temporal bone that is located just behind your ears. 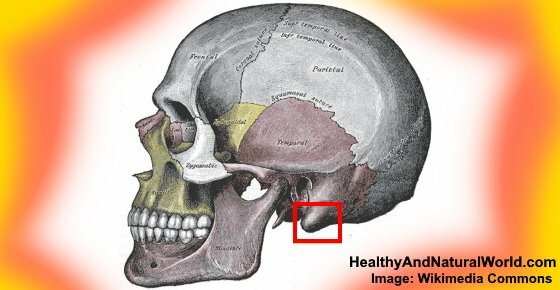 The mastoid process is a small triangular-shaped bone that protrudes from either side at the base of your skull. You can locate your mastoid if you place your fingers behind your earlobe. The main function of the mastoid process is to connect your neck muscles to your skull and help regulate pressure in your ear. The mastoid process has a structure of a honeycomb full of mastoid air cells. The mastoid can become painful if you have a middle ear infection. This can happen because of inflammation due to infections, pus filling the mastoid air cells, trauma to the skull, or cysts just behind either of your ears. Usually, getting rid of pain in the mastoid process requires treating the underlying cause of pain behind your ears. In this article, you will find out about the different reasons behind ear pain that is connected with your mastoid process. You will also find out how to treat middle ear infections to help prevent the mastoid process pain getting worse. Many medical websites describe the mastoid process as a conical or pyramidal projection at the base of either side of your skull. That is why many doctors feel behind both ears to check for signs of pain or inflammation if you have a suspected ear infection. The mastoid surrounds the inner and middle ear. Although your mastoid process can become sore and inflamed if you have an ear infection or cyst behind your ear, its functions aren’t all connected with your hearing. Many muscles and nerves in your head are connected to the mastoid process. These muscles connect to the mastoid process and help in rotating and flexing your head and also opening your jaw. If the area around the mastoid process becomes infected or inflamed, you will usually have pain behind your ear. It is possible that inflammation and swelling can occur in the honeycomb-type structure of the mastoid process. Let’s look in more detail why you might have pain and swelling behind one or both of your ears. An infection in your middle ear (otitis media) is usually to blame for mastoid process pain and is commonly called mastoiditis. Doctors usually treat serious middle ear infections with antibiotics. These help to kill off bacteria that are causing a buildup of pus and stop discharge from your ear. Sometimes, surgery is needed to drain fluid from the middle ear or remove the infected mastoid. If you have to take a course of antibiotics, it’s important to remember to take probiotics to help restore healthy bacteria to your gut. That can also help to prevent outbreaks of yeast infections as a result of antibiotics. For information on how to treat mild cases of an outer ear infection, please read my article on how to get rid of an ear infection. One reason for mastoid process pain in just one ear is a cholesteatoma. If the cholesteatoma causes mastoid pain with an infection, then symptoms of mastoiditis will be present. This includes smelly drainage from the ear, redness and swelling at the back of the ear, and mastoid process tenderness. Usually, doctors have to remove the cholesteatoma to prevent repeated ear infections and permanent injury to the hearing. Trauma to the temporal bone on the side of your skull where the mastoid process is located can cause pain and other complications. Your doctor may order blood test for checking the levels of the enzyme creatine phosphokinase (or, CPK) in the blood. If you have any kind of head injury or damage to your brain tissue, it will cause CPK lab tests to show higher than normal results. Mumps is a viral infection affecting mostly children that can cause mastoid process pain behind the ears and a swollen jaw. Usually, the symptoms of mumps are treated by drinking plenty of fluids and resting in bed. Because mumps is contagious, patients are usually isolated from others to prevent spreading the infection. In very rare cases, a cancerous tumor could be a reason for pain in the mastoid process. It is good to remember that in the majority of cases, swelling and pain behind one or both ears is usually the result of a middle ear infection and not cancer. Although this type of infection can be serious, it is usually treatable without any long-term complications. Mastoid process pain that has signs of inflammation behind either ear should not be ignored. Inner or middle ear infections can cause serious complications and be difficult to treat if left too long. Also, children are more prone to mastoiditis and require prompt medical attention to treat signs of an ear infection. Mastoid pain behind the ears lasts for more than one day. The pain is very severe and is persistent. You notice discharge or pus draining from your ear. A child who is less than 6 months old has ear infection symptoms. Along with pain and swelling behind the ear, you have hearing loss, dizziness, or nausea. You or your child has a stiff neck and high fever. AUU. Role of the mastoid in the middle ear function. HeathHarvard. Chronic otitis media, cholesteatoma, and mastoiditis. Craniomaxillofac Trauma Reconstr. 2010 Jun; 3(2): 105–113. MayoClinic. Bump on the head. CDC. Signs and symptoms of mumps. Ghana Med J. 2005 Mar; 39(1): 28–32.